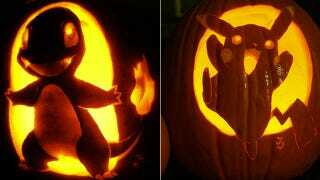 Pokémon Jack-o'-Lanterns, Gotta Carve 'Em All! October is right around the corner—and so is Halloween. While I haven't picked out my costume (must remember to! ), I have been thinking about what I'd like to carve into an orange gourd. These Pocket Monster carvings provide plenty of inspiration. These photos popped up on Tumblr site Think Like No One Else, and I'm not sure who exactly did these wonderful jack-o'-lanterns. If it wasn't that site and you happen to know who, please pass that along!